14ymedio, LUZ ESCOBAR, Havana, 17 January 2015 — “Where is the end of the line for a picture with the Cuban bear?” yesterday asked a youngster during the opening of the United Buddy Bears show in Havana’s San Francisco Plaza. The project, created in 2001 by Eva and Klaus Herlitz with the collaboration of Austrian sculptor Roman Strobl, promotes a message of tolerance and understanding among all peoples, cultures and religions of the world. The exposition has travelled across five continents with life-sized sculptures of bears that evoke the member countries of the United Nations. 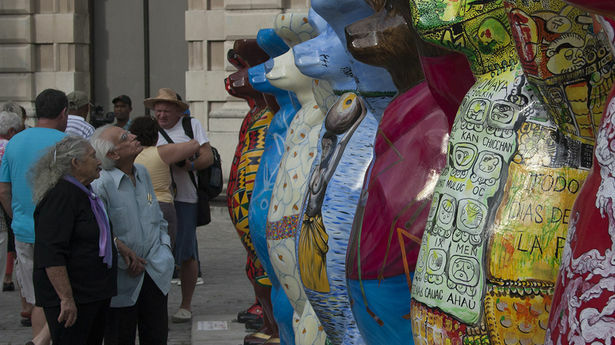 With the participation of artists from each of the represented countries, these bears have visited cities such as Vienna, Cairo, Jerusalem, Buenos Aires, Montevideo, Paris, Hong King, Istanbul, Tokyo, Sydney, Warsaw and Rio de Janeiro. Since its first exhibition in Berlin in 2002 they have been appreciated by more than 30 million people. 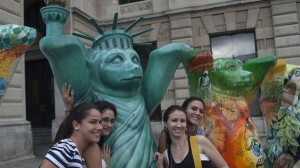 Now, they are in Havana, which highlights the signature sculpture of our country, made by Cuban artist Nancy Torres. Also participating in the ceremony was the German ambassador to Cuba, Peter Scholz, who said that he hoped that “the bears are capable of sharing much pleasure and happiness during the next six weeks and attracting visitors from all over. Because I hope that the bears give us much zest for life.” The show will be in San Francisco Plaza until the beginning of March of this year and during this time it is expected that a three-foot high replica bear that represents Cuba will be auctioned off. Havanans have already chosen their preferred bears and stand in line to get their pictures taken in front of the one that represents the Statue of Liberty of the United States. Among the most appreciated also are those of Spain, France and Germany. Meanwhile, the Cuban bear has received several critiques from those who see the inclusion of the cigar as a promotion of the harmful habit of smoking in an exhibit that is aimed mainly at children. The United Buddy Bears exhibit has been associated with projects by UNICEF and with help for needy children. From donations from local organizations and the auction of some pieces so far about two million euros have been raised for the children. 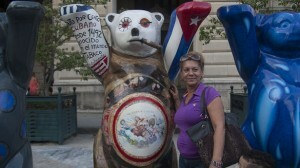 The project promoters Eva and Klaus will accompany the bears during their Havana stay.